Why Do Your Pupils Get Larger When You're On Drugs? 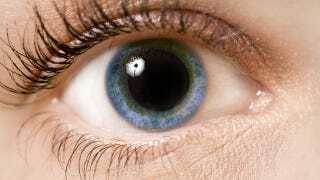 Normally, our pupils dilate in response to changing light; as it gets darker, our pupils get larger. But they expand in size for other reasons as well, including when we're sexually aroused and when we're performing complex cognitive tasks. But it's also known that certain medications — including illicit drugs — can cause pupils to get larger. Here's why. Pupil dilation, what's also referred to as mydriasis, happens when one of two muscle groups become activated, namely the iris sphincter (yes, that's what it's called) and the iris dilator. The sphincter response is triggered by the parasympathetic nervous system (what regulates our autonomic bodily processes when we're at rest), and the dilator by the sympathetic nervous symptom (what controls physiological responses requiring a quick response — like fight-or-flight). Needless to say, psychotropic drugs can have a profound effect on both of these systems. Depending on the type of drug taken, therefore, either muscle group can become engaged. Essentially, if a drug can trigger a parasympathetic or sympathetic response, there's a good chance that it will also impact on pupil dilation. Specifically, mydriasis can be caused by stimulants and any drug that influences the adrenal glands — what can trigger certain parasympathetic responses. For example, drugs like MDMA, ecstasy, cocaine, amphetamines, and some antidepressants (like SSRIs) can increase serotonin levels in the brain — a crucial neurotransmitter that regulates mood, including feelings of happiness and well-being. Serotonin agonizes to the 5-HT2A receptors in the brain — what has the downstream effect of triggering the mydriasis response, and in some cases, psychedelic episodes. Consequently, mydriasis also occurs in people who take serotonin-inducing psychedelics like LSD, mescaline, and psilocybin. Drugs that trigger the release of dopamine, a related neurotransmitter, can also induce mydriasis. Marijuana is a good example. Dopamine cause pupils to dilate by exciting the adrenergic receptors, what in turn increases adrenaline (which the autonomic nervous system is sensitive to). It's important to remember that not all drugs will produce the same degree of pupil dilation. For example, MDMA will have a much more profound effect on pupil dilation than, say, an antidepressant. And interestingly, other drugs, like opiates, cause the opposite effect — pupil contraction, or what's known as miosis. A version of this io9 flashback story ran on io9 in 2012.